German-based chemicals giant Bayer AG has reportedly offered US$122 in cash per share in its bid to acquire Monsanto, valuing the US agchem company at US$62 billion. This represents a 35 per cent premium over the company’s share price on the day before the offer was made. Bayer, which admitted its interest in Monsanto last week, says the two companies would be beneficial, in particularly combining its own strength in crop protection and plant health with Monsanto’s breeding and seed portfolio. This is an area Bayer has been exploring in recent years; including its acquisition of Dutch seed company Nunhems. James Blome, CEO of Bayer Crop Science, has reportedly said that said that if the deal is approved the headquarters for joint crop science efforts would be in St. Louis in the Unites States. The post Bayer offers US$62 billion for Monsanto appeared first on Hort News on Tuesday 24 Mya 2016. This entry was posted in HortNews and tagged Bayer, business, crop protection, Monsanto on 26 May 2016 by Richard. Valley Grown Nurseries has official opened its latest block of glass following its lengthy legal battle with local planning authorities. 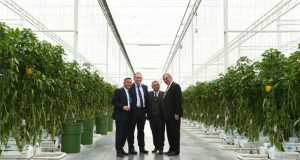 NFU President Meurig Raymond was one of the guests at the opening and said, “Self-sufficiency in the horticultural industry has fallen for a number of years. We now import four out of every five tomatoes eaten in this country, at a time when the public is actively seeking to buy quality British produce. The post Valley Grown opens new glass appeared first on Hort News. This entry was posted in HortNews and tagged development, greenhouse, Lee Valley, planning, Valley Grown Nurseries on 26 May 2016 by Richard. Most fruit imported into the UK comes from outside the European Union (60 per cent), whereas the EU is the main source of imported vegetables data shows. Over the last three years total imports of fruit and veg have risen by 12 per cent. The biggest supplier of fruit to the UK is Spain at 679,523 tonnes of fresh fruit, followed by South Africa and Costa Rica with 346,359 and 303,221 tonnes respectively. Spain is also the largest supplier of vegetables to the UK supplying 1.01 million tonnes, closely followed by The Netherlands at 744,239 tonnes. Between them these two horticultural powerhouses supply 64 per cent of UK vegetable imports. Tomatoes are one of the main imports, and while the volume of potatoes and carrots fell last year, legumes increased by 55 per cent. The post Most UK fruit imports from outside EU appeared first on Hort News. This entry was posted in HortNews and tagged fruit, imports, markets, vegetables on 26 May 2016 by Richard. Data from Kantar Worldpanel shows that berry sales in the UK now account for a fifth of total fruit consumption making them more popular than apples and bananas as the popularity of juices and smoothies shows no signs of slowing down. The figures came as British Summer Fruits predicted a record breaking strawberry harvest this year thanks to ideal spring growing conditions. Up to 74,000 tonnes of the fruit is predicted to be produced over the coming summer. The top retail varieties are Malling Centenary; Elsanta; Sonata; Sweet Eve; Driscoll’s Jubilee; Ava Rosa; Red Glory; and Capri. The post Berry sales rise as bumper harvest looms appeared first on Hort News. This entry was posted in HortNews and tagged Blueberries, marketing, raspberries, soft fruit, strawberries on 26 May 2016 by Richard. The finding comes from the UN’s Joint Meeting on Pesticides Residues (JMPR) and contradicts an opinion from the World Health Organisation’s (WHO) specialist cancer research agency IARC, which classified glyphosate as ‘probably carcinogenic to humans’ last year. The JMPR included experts from the WHO and the UN Food and Agriculture Organisation (FAO). The group recommended that the acceptable daily intake limit (ADI) for glyphosate should remain at 0-1mg per kilo of body weight, the current level. Last year’s recommendation by EFSA to increase the glyphosate residue threshold from 0.3mg to 0.5 mg/kg is still within these limits. The post Latest UN report says glyphosate unlikely to cause cancer appeared first on Hort News. This entry was posted in HortNews and tagged glyphosate, herbicides on 23 May 2016 by Richard. Despite its recent launch of the ‘Great British Food Unit’ to promote the sale of British produce, recent statistics have revealed that the Department for Environment, Food and Rural Affairs (Defra) building in London sources 44% of its food from overseas producers. According to Defra, between January and March this year just 56 per cent of the food sourced for Nobel House in London came from British producers, a rise of 4 per cent on the previous three months. The post Defra criticised for importing food appeared first on Hort News. This entry was posted in HortNews and tagged Defra, food, Nick Smith MP on 20 May 2016 by Richard. Is Bayer lining up to buy Monsanto? According to the news agency Bloomberg, multinational chemical company Bayer AG may be preparing to purchase Monsanto. Reports suggest that the German-based business has already held internal discussions and has talked to advisors about the possible deal which, if successful, would create the world’s largest agrochemical and seed company. With a valuation of around €79 billion, Bayer is almost twice as big as Monsanto which has an estimated market value of €43 billion. However, financial analysts have suggested that Bayer would need to sell off certain assets to obtain sufficient funds for a deal and also point out that such a large merger would create ant-trust and competition issues around the world. ‘Competition regulators are already investigating the $130 billion merger between Dow Chemical Co. and DuPont Co., while national security officials in the U.S. weigh China National Chemical Corp.’s bid to acquire Syngenta AG of Switzerland for $43 billion,’ says Bloomberg. The post Is Bayer lining up to buy Monsanto? appeared first on Hort News on Wednesday 18 May 2016. This entry was posted in HortNews and tagged Bayer, business, Monsanto on 20 May 2016 by Richard. Sainsbury’s has become the first company in the world to take delivery of Carrier Transicold’s prototype natural refrigerant trailer unit. The new generation of transport refrigeration system for trailers operate exclusively with carbon dioxide (CO2) refrigerant, which has a global warming potential (GWP) of just one making it the baseline against which all other refrigerants are measured. The GWP of CO2 is also lower than other natural refrigerants, such as propane and ammonia and it is non-ozone depleting. The delivery marks the first of three units to join the Sainsbury’s fleet this year as part of a three-year technology field trial and builds on the success of a 2013 pilot, which saw the supermarket operate a modified refrigeration system for ocean containers – making it the first naturally refrigerated trailer operating anywhere in the world. The post Sainsbury’s trials trailer with natural refrigerant appeared first on Hort News. This entry was posted in HortNews and tagged business, cooling, refridgeration, Sainsbury's, transport on 20 May 2016 by Richard. RHS Wisley student Lawrence Wright has been names as the overall winner of the Chartered Institute of Horticulture Young Horticulturist of the Year 2016 at the finals held at the National Botanic Gardens, Glasnevin in Dublin on May 7th. Lawrence, currently studying at RHS Wisely, received the £2500 Travel Bursary provided by the Percy Thrower Trust and will be able to use it to further his horticultural career anywhere in the world. Lawrence, who won the South East Branch heat to get his place in the final, receives a £2,500 Travel Bursary provided by the Percy Thrower Trust, which he will be able to use to further his horticultural career anywhere in the world. The runner-up in the competition was Joshua Stevens while third place went to Fern Champney. The post Young Horticulturalist of the Year crowned appeared first on Hort News. This entry was posted in HortNews and tagged Chartered Institute of Horticulture, CIoH, competition, Young Horticulturist of the Year on 13 May 2016 by Richard. According to new research from Colorado State University (CSU), nitrogen cycle disturbance from emissions of agriculture-related ammonia now exceeds the effects of fossil fuel combustion emissions, in the US at least. Most attention in recent years has focused on the fossil fuels and major strides have been made to stem these emissions. In contrast, ammonia from agricultural processes has received relatively little attention in the US, and ammonia is not a regulated pollutant. The CSU researchers found that ammonium has now surpassed nitrates as the dominant source of nitrogen deposition and subsequent disruption to the nitrogen cycle in the country. The post Agricultural emissions could be more harmful than fossil fuel appeared first on Hort News. This entry was posted in HortNews and tagged climate change, emissions on 13 May 2016 by Richard.